On their way back to join their guests for the wedding reception, the bride and groom walk balk along the sand. The soft light of the hour before the sun sets casts a faint glow on the entire beach, and the water gently lapping at the sand sparkles with light. The bride’s gown is illuminated from behind with light from the sun, outlining her figure in the Vera Wang dress. 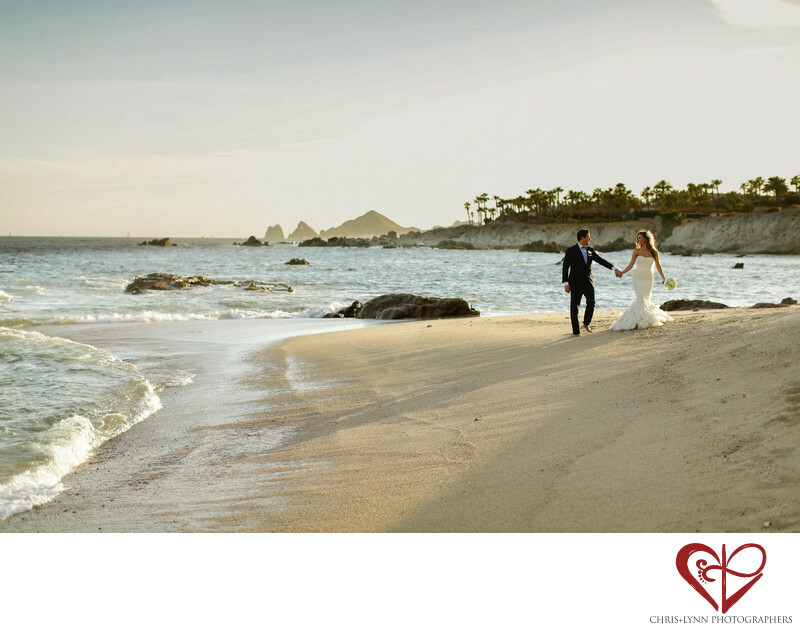 The couple holds hands as they stroll across the sand, enjoying the view and the company. The palm trees bordering the Esperanza Resort property sway in the breeze, and in the distance, the famous Cabo Arch glows with light from the setting sun. This is the perfect hour for beach portraits as the sun sets and everything glows gold. The look exchanged between the bride and groom here is truly magical. 1/2000; f/2.0; ISO 100; 50.0 mm.